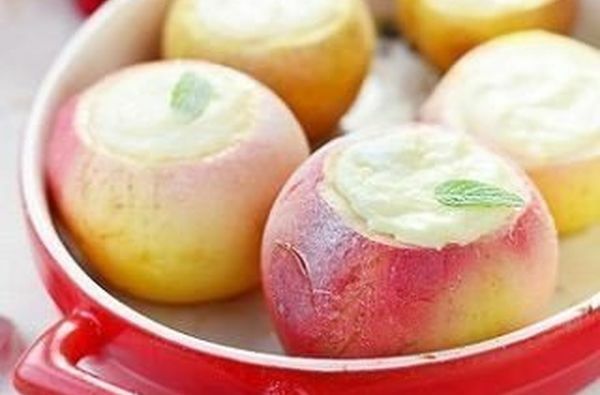 Baked apples with cottage cheese dish is so elementary that to cook them, even a child or very far from cooking. Dessert this healthy and low fat, suitable for baby food after one year and the dietary table. The egg yolk — 1 PC. 1. Apples better to take the same size, but not necessarily. Color and variety are not a factor, the main thing that the apples were too soft and fell apart. Wash the fruit, cut off the lids. Use a teaspoon to remove the core with seeds, not to cut the apples through and leaving thick walls. 2. Put in the bowl of a blender cottage cheese, sugar powder, starch, sugar or vanilla extract and egg yolk. Refactor into a homogeneous mass. If you want you can also add washed and drained small raisins. 3. The apples are put into a suitable baking dish greased with butter. Fill the apples with cheese filling tightly. 4. Bake the fruit in a pre-heated to one hundred and ninety-degree oven for about thirty minutes, readiness can be checked with a knife, wall Apple should easily protegerse. Serve the apples warm, you can sprinkle with powdered sugar. Cold, this dessert is also very good.